This week has been quite buzy with my regular routine that I am hardly finding time to blog. Just managed to catch up with all my pending blog visits today. Green Chutney alias Coriander Chutney is one of my kitchen essentials. I prefer to prepare them and stack in my freezer. This could be used as Sandwitch Spread or as spicy chutney for Chats. You can try the other chat essential Dates Chutney too. In a blender add chopped coriander leaves , green chillies , salt ,peanuts and grind them into a fine paste adding very little water if required. If using this Chutney for Chat , use a bit of Sev to grind instead of peanuts. Lemon Juice will help the chutney to retain the green-ness. Chutneys could be stored in small air tight containers in freezer for atleast 3-4 months. Once taken out ,do not refreeze them. Sending this lovely coriander chutney to Sree vali’s Spicy Fiery Chutneys event. Wow…lovely post dear..thanks for ur tip to retain the green color…mine usually turn very dark after freezing. awesome..this is a must spread for my sandwiches.. I always stack this chutney in freezer…. roasted peanuts or unroasted ones? Nice tip about using lemon , will try this next time ! 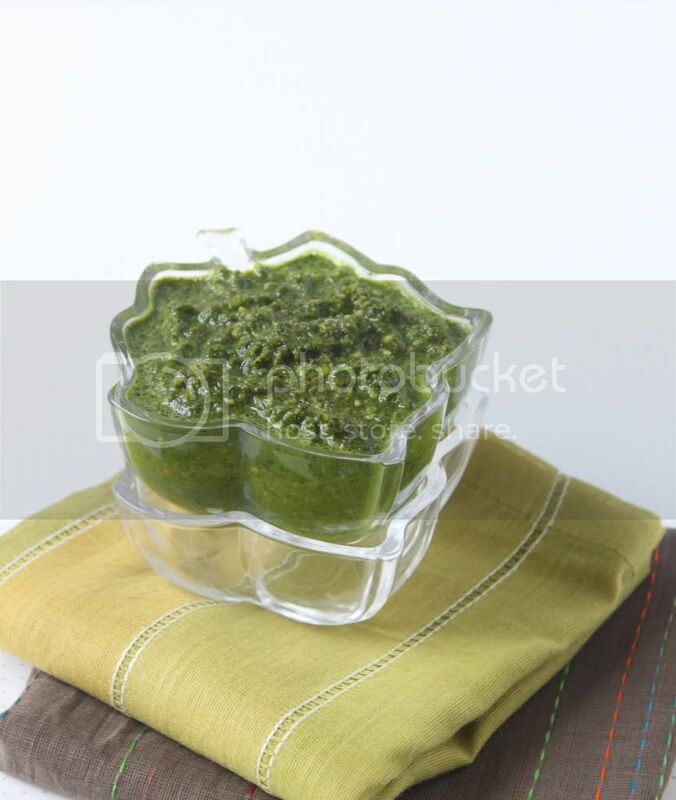 Nice recipe dear..Gotta try it soon..
Green chutney looks prefect,eyecatching colour Sandhya! Having read the name I was salivating, by the time I clicked your recipe on my reading pane to opening here I was so impatient for the recipe. Excellent chutney Sandhya.There is an event for the chutneys, will forward the link to you, send it in, I love this. Yummy chutney and thanks for sharing the great tip..Will give a try. lovely green chutney. My all time favourite will go with any snack. yummm…just like the way the i make it. I love the flavor peanuts add to the chutney. Well, a vegan diet is bascally a vegetarian diet , minus diary products. Vegans don't consume milk or milk products because milk producing cows are treated like animals. It's very easy to thrive on avegan diet in western countries as the supremarkets are flooded with diary-free products. Visit http://earthvegan.blogspot.com/ for delicious Indian veganised recipes. Wow sandhya green chutney is very perfect. Adding peanuts is new to me..must try! Yummy chutney! Yummy chutney Sandhya. I am sure it will be handy accompaniment with various things to just spice them up instantly! @ Potpuri – Its unroasted Peanuts.